Joey Logano and his Penske Racing Nationwide Series team used a late-race decision on tires to get the victory in Saturday’s 5-Hour Energy 200 at Dover International Speedway. Logano trailed race leader Kyle Busch by five seconds with 40 laps left, but a two-tire under the fifth and final caution got Logano out front for a restart with 34 laps left, while a four-tire choice on the same pit stop buried Kyle Busch in traffic and changed the course of the race. 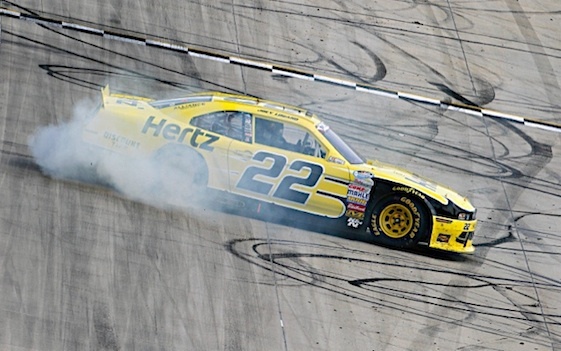 The victory was Logano’s first of the season, his third straight at the Monster Mile and the 19th of his career. Brian Vickers ran second, .576 seconds behind Logano. Matt Kenseth finished third, followed by Trevor Bayne. Busch passed Sam Hornish Jr. for the fifth spot in the closing laps. Bullins made the decisive call after observing that Busch was taking four and that there were enough other cars taking two tires to form a buffer between Logano and Busch. Bullins said he made the snap decision as his crew was dropping the jack on the right side of the car. Kasey Kahne was an integral part of the third caution, on Lap 113, when he made Mike Wallace pay for repeatedly holding him up by punting Wallace’s car off Turn 2. Kahne used the opportunity to grab the race lead, thanks to a two-tire call under the yellow on Lap 114. Kahne held off Busch after the restart on Lap 121, but a quick caution a lap later — after Reed Sorenson’s Chevy stalled at the exit from pit road — gave Busch another shot at a restart on Lap 129. Busch cleared Kahne into Turn 1 on the restart lap and opened a lead of nearly one second. But a caution for Dexter Stacey’s spinoff Turn 4 on Lap 161 turned the race upside-down. Busch and Kahne took four tires on a Lap 163 pit stop under caution, while nine other lead-lap cars went with two-tire calls and came out ahead of Busch and Kahne, who restarted 10th and 11th, respectively. Mired in traffic, Busch struggled to move forward, and Logano, who led the field to green on Lap 167, drove away. Vickers, the 2003 Nationwide Series champion, mirrored Logano’s tire strategy on the final caution and left the track with the satisfaction of a runner-up finish — but with an unsated hunger for a victory. 1. (6) Joey Logano(i), Ford, 200, $43630. 2. (11) Brian Vickers, Toyota, 200, $38190. 3. (9) Matt Kenseth(i), Toyota, 200, $23565. 4. (12) Trevor Bayne, Ford, 200, $27490. 5. (3) Kyle Busch(i), Toyota, 200, $22715. 6. (5) Kasey Kahne(i), Chevrolet, 200, $17465. 7. (2) Sam Hornish Jr., Ford, 200, $22050. 8. (1) Austin Dillon, Chevrolet, 200, $27210. 9. (7) Regan Smith, Chevrolet, 200, $21415. 10. (15) Kyle Larson #, Chevrolet, 200, $23240. 11. (14) Parker Kligerman, Toyota, 200, $20765. 12. (13) Justin Allgaier, Chevrolet, 200, $20640. 13. (19) Michael Annett, Ford, 200, $20540. 14. (10) Brian Scott, Chevrolet, 200, $20415. 15. (16) Travis Pastrana, Ford, 200, $21515. 16. (20) Cole Whitt, Toyota, 200, $20265. 17. (4) Alex Bowman #, Toyota, 200, $20190. 18. (17) Mike Bliss, Toyota, 200, $20140. 19. (21) Jeremy Clements, Chevrolet, 200, $20090. 20. (22) Nelson Piquet Jr. #, Chevrolet, 200, $20715. 21. (33) Jeffrey Earnhardt #, Ford, 199, $19985. 22. (30) Landon Cassill, Chevrolet, 198, $19885. 23. (8) Ty Dillon(i), Chevrolet, 198, $19810. 24. (32) Eric McClure, Toyota, 195, $19760. 25. (27) Dexter Stacey #, Ford, 195, $20185. 26. (34) Harrison Rhodes, Ford, 195, $19660. 27. (36) Danny Efland, Chevrolet, 192, $19610. 28. (18) Elliott Sadler, Toyota, 191, $20535. 29. (25) Reed Sorenson, Chevrolet, 190, $19460. 30. (40) Tony Raines, Toyota, Fuel Pump, 111, $19710. 31. (24) Mike Wallace, Chevrolet, Accident, 109, $19360. 32. (37) Jason White, Toyota, Engine, 62, $19315. 33. (26) Joe Nemechek, Toyota, Accident, 43, $19245. 34. (35) Joey Gase, Toyota, Electrical, 33, $19200. 35. (29) Jeff Green, Toyota, Vibration, 18, $13155. 36. (38) Morgan Shepherd, Chevrolet, Engine, 14, $12260. 37. (28) JJ Yeley(i), Chevrolet, Overheating, 11, $12240. 38. (23) Josh Wise, Chevrolet, Electrical, 9, $12176. 39. (31) Matt Dibenedetto, Dodge, Handling, 6, $12075. 40. (39) Blake Koch, Toyota, Brakes, 4, $12020. Average Speed of Race Winner: 111.145 mph. Time of Race: 1 Hrs, 47 Mins, 58 Secs. Margin of Victory: 0.576 Seconds. Lap Leaders: A. Dillon 1-35; K. Busch(i) 36-47; A. Dillon 48-52; J. Logano(i) 53-81; A. Dillon 82-84; T. Bayne 85-89; K. Busch(i) 90-114; K. Kahne(i) 115-128; K. Busch(i) 129-163; J. Logano(i) 164-200. Leaders Summary (Driver, Times Lead, Laps Led): K. Busch(i) 3 times for 72 laps; J. Logano(i) 2 times for 66 laps; A. Dillon 3 times for 43 laps; K. Kahne(i) 1 time for 14 laps; T. Bayne 1 time for 5 laps. Top 10 in Points: R. Smith – 411; S. Hornish Jr. – 384; B. Vickers – 369; J. Allgaier – 368; A. Dillon – 358; P. Kligerman – 355; E. Sadler – 347; B. Scott – 343; K. Larson # – 322; T. Bayne – 321. You can look at that Top 10 and think the Cup drivers stunk it up (and you would be right), but there is still an impressive look at drivers going for the NNS Championship. Trevor & Sam needed those points BADLY. Kyle raced for his first time at Dover!. Annett finished well after his long rehabilitation. All good storylines despite the complaint of JGR ruining NNS.